The 2017-18 season of the Big Bash League is underway and there have already been several strange things happening on the field from time to time. 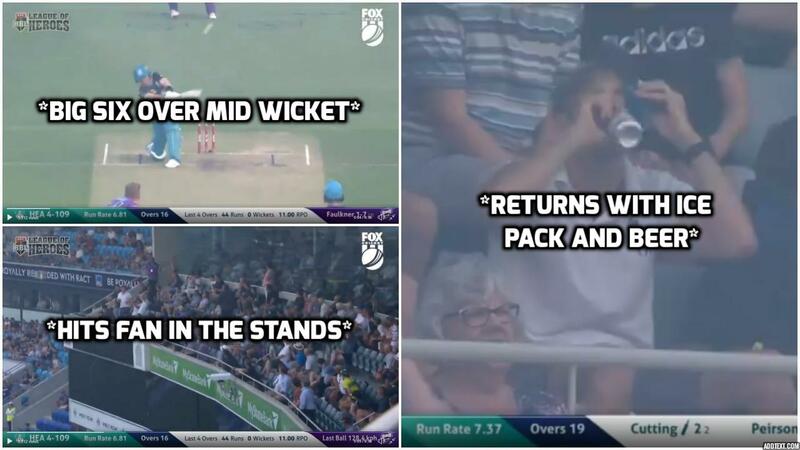 A similar incident occurred in a recent clash between Brisbane Heat and Hobart Hurricanes in which a spectator in the stands got hit on the face by a six hit by Heat wicketkeeper batsman Jimmy Pierson. It was in the 17th over of the innings when James Faulkner bowled a length ball in the first ball. Pierson made room for himself in the crease and dispatched Faulkner into the stands over mid wicket. The ball sailed over the boundary ropes but ended up hitting a spectator on his face. It was his attempt to catch the ball which resulted in the injury. The injury however wasn’t a major one but could have been much more lethal had he failed to spot the ball coming his way. The fan who was hit by the ball was later spotted returning to his seat with an ice pack and refreshing beverage. Very good for Jimmy Peirson who launched this ball into the crowd.